Over the months and years a WordPress site will grow and grow with pages and posts. Older posts become buried under the new content and may not be easy to find for someone browsing your site. It is good to have a page that allows for easy navigation to older content, sometimes referred to as a site map or site index. 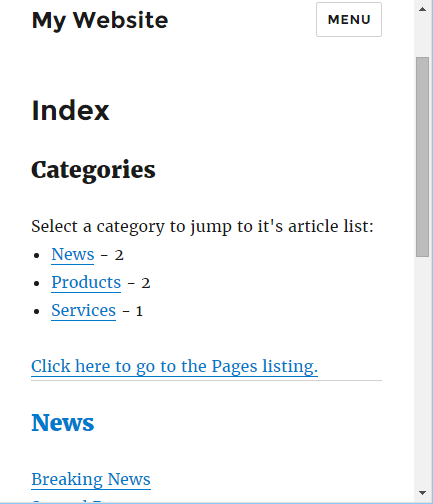 A good site index would list each category and the posts in each category, preferably in alphabetical order. There are WordPress plug-ins available for similar functionality though some can be overly complex. It can be difficult to find a straightforward way to index a site when searching for the answer on the Internet. Information on producing a site map or index page will often throw up articles on the sitemap.xml file format. sitemap.xml is used by search engines to help build a search index on a site. Thus that file is important for your website and one is recommended, however, your website visitors would appreciate a page with a human readable site index that they can use when needed. This article shows you how to add such a site index to a WordPress based website. The website index defined in this tutorial will be formatted as follows. The index list all the categories, in alphabetical order, and shows the number of posts in each category. Below the category list every post is then listed for each category, again in alphabetical order. Clicking on a category in the first list will take you to the list of posts in that category. Each list entry for a post will link to the post itself. Finally there is a list of the site's pages. The following method shows how to add this useful page, as a Template, to a theme on a WordPress site. A child theme is recommended when modifying themes but you can also add the Template to an existing theme directly. Create a new file in your theme's directory, most hosting sites provide a control panel to allow you to do this and will have online help to show you how. Alternatively create the file in a temporary directory on your computer for uploading when the editing of the file is complete. Call the file sitemap.php or some other name that is relevant. Edit the file using the online tools provided by your hosting company, or on your computer in a text editor program, such as Notepad on Windows. Add the following code to the file (copy and paste it in) and save it, alternatively you can download it from here. * The template for displaying a comprehensive site index (site map). If not created in your themes directory then upload it. For example if you are using the default Twenty Sixteen theme then it should be saved in the wp-content/themes/twentysixteen folder. If unsure on how to do this your hosting company will be able to help. Those familiar with HTML and PHP should be able to modify the code further for their needs. This website index Template will help visitors navigate larger WordPress based websites. Enjoy your web publishing. For a full list of all the articles on Tek Eye see the full Index.